Artificial Intelligence and Machine learning are heralded as the holy grail of humanity's future. What began as an over-imaginative idea in sci-fi movies of the 80's is no longer confined to Hollywood adaptation. The steady stream of artificial intelligence trends that roll out year-after-year is proof enough of how far we are willing to go to adapt AI and machine language for a benevolent cause. However, it is only a minority who believe in the altruistic side of AI. It is a common fear that humanity's negligence with AI would one day unfurl the catastrophe in the Terminator franchise. At present, away from the debate, AI is steadily evolving. It is penetrating more verticals and lowering the cost and risk involved in many resource-intensive functions. In recent years, its practical purpose has broadened thanks to the vigorous movement to make AI and machine learning smarter and more intuitive to mimic human cognition. But are we headed the right way? Will AI and ML make future a better place? What are the artificial intelligence trends for 2019? The answers are right ahead. The fast-paced growth in AI has paved way for efficient use of AI enabled tools that churn out powerful insights to facilitate strategic business decisions. AI and ML combo will efficiently learn fresh developments in the marketing landscape and recommend strategies that are appropriate for the prevailing marketing circumstances to bring a tremendous advantage over the competition. As per the AI trends for 2019, the system will learn to become proactive than reactive. Moving ahead, it's not just simplicity and cost saving that will lure investors towards Artificial Intelligence based market research. It is the ability of this technology, in conjunction with the Cloud to make businesses become more innovative in every step. Healthcare sector is already making progress by taking advantage of artificial intelligence and machine learning predictions of the recent past. Being an industry that is expected to be on the edge of latest innovation, AI and Big Data will play a key role in the elimination of diseases like cancer. By using historical data and case history of patients, AI would soon shed light on the inner mechanism of the invasive diseases so that the hidden phenomena can be studied in a broad sense. Innovation is robust in smart prostheses of late. According to AI and machine learning predictions for 2019 intelligent sensors powered by AI will help people with permanent disabilities to sense light, image, sound, and pressure. The smart prosthesis is considered as a next big leap in medical science as it gives people a second chance to overcome life-changing disabilities. Every now and then we hear about AI based robots, bots, and chatbots mimicking the human skills such as decision making, carrying the conversation, locomotion, hazard prevention, etc. Regardless of how you feel about AI and its reliability to process Hard Data, we are headed in the direction of a smart and networked future where algorithms constantly learn from every interaction by gathering behavioral data to simplify challenging functions that are otherwise prone to error in the hands of humans. Be it virtual nurses that predict signs of illness, or driverless cars that prevent collision, or website chatbots that slide in to provide personalized support we have seen AI and its footprint in almost every occupation. Volatile markets, political ball game, predatory commerce pose imminent risks to financial growth. 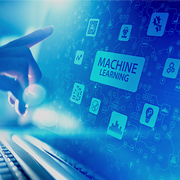 According to top machine learning trends, the finance sector will see reduced risk and better preparedness as more institutions rely upon AI, Big Data, and predictive models to prevent fraud and corruption through preventive vigilance. Soon, companies that bank upon AI and machine learning will be in a better position to anticipate risks, predict unplanned expenses, and do so much more to run lean in competitive markers. AI based predictive modeling will save dollar and time while enhancing the accuracy of building large and more complex reports based on Big Data. Based on AI and machine learning trends of the past, it has the potential to enable stability and efficiency across the financial industry. Although not every function can be automated, AI can be counted upon to make analytics more precise and efficient when compared to the manual method of running analytics. Apple's Siri and Microsoft's Cortana needs no introduction. Being classic examples of an intelligent AI and Cloud-based virtual assistant, they have served countless smartphone users by constantly learning the search pattern to recommend personalized results to its users. The complex systems behind these implementations are tirelessly running algorithms that track the online behavior and personal preferences to uniquely understand each user. The information captured by virtual assistant enabled devices will help marketers to design campaigns to pitch solutions to end users that will make them click the CTA. As part of machine learning trends, personalization of search results by using AI-powered analytics is going to be the next big leap in business. Artificial Intelligence trends are more likely to impact the performance of real-time targeting, natural language search, conversational commerce, predictive merchandising, and more. As we inch closer to the second decade of the millennium the image sharing will shake up the way businesses drive visual engagement. Under upcoming artificial intelligence trends, smart brands are predicted to harness AI-powered tools to hunt viral images and interpret the story behind it. Using AI to sift through a gargantuan pile of images can propel businesses further ahead of the curve because as we know, visual media is the bread and butter of social media engagement. Any social channel where the image is shared along with the brand message is likely to rake up 2.3 times more interaction. However, marketers who rely on manual methods to retrieve insights are less likely to benefit from the productive brand building. Image recognition software keeps track of every potential image repository and maintains a database of addresses from where they can be retrieved by using a search keyword. By tracking this information, it becomes easier to understand the best approach to product placement. Many technology experts postulate that the future of AI and machine learning is set in stone. It is where the world is headed. In 2019 and beyond these technologies are going to shore up support as more businesses come to realize the benefits. However, the concerns surrounding the reliability and cybersecurity will continue to be hotly debated. The artificial intelligence trends and machine learning trends for 2019 and beyond hold promises to amplify business growth while drastically shrinking the risks. So, are you ready to take your business to the next level with Artificial Intelligence trends? Outsource2india is an ISO 9001:2015 certified software development company that offers an array of cost-effective AI services to help your business become smarter and intuitive. With ever-growing data stream, the competition is stiff to efficiently capture and turn Hard Data into powerful insights. Backed by 20 years of core industry exposure, we have the right resources and skilled team to leverage Artificial Intelligence trends and Machine Learning trends to help you make the best business decisions. We offer a 360-degree support to help you from your local time zone over the phone call, email, and web chat. We also offer other services such as IT consulting, Agile development, business application development, and more. Get in touch with us to know how we can help you with AI based services within your budget.